Technology is a great enabler, and can support students with special educational needs and disabilities to access learning and create meaningful content. The programming elements of the computing curriculum can, however, be quite daunting for some students, particularly those who struggle with reading and spelling when faced with a text-based language. 1. Enable students to create programs that can provide immediate feedback, preferably in physical form. 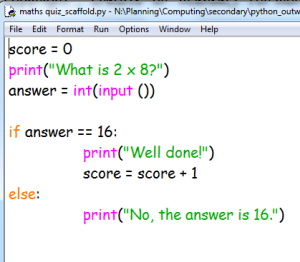 Students will be far more engaged if they can achieve a concrete outcome with only a few lines of code. For example Sonic Pi which can be used to compose and play music. This is a text-based language, but with only a few basic commands you can play a tune. CodeBug is a small, wearable device that uses block-based commands and it is simple to create scrolling text or a basic animation. 2. As Miles Berry stated in a recent presentation, “It’s easier to read code than to write code”. Provide students with a completed program and ask them onhealthy what it does, then ask them to edit, remix, or build upon the code. This is much more achievable than typing in lines and lines of code from memory or the board. In addition you could provide a complete program with gaps and students choose the missing code from a selection, or they could reorder code to make it run (thanks to Alex Jones for these latter ideas). 3. If you are teaching Python and using IDLE, go to Options > Configure IDLE and here it is possible to change the typeface and font size to make it more accessible. In addition you can change the colour for elements such as Python keywords and strings, to make it more obvious where there is an error. You can also change the background colour to support dyslexic or visually impaired students. For more ideas on supporting students with SEND in Computing sign up for the Computing Conference with CAS Regional Centre for Yorkshire and Humber, at the National STEM Centre on the 29th June where I’ll be running a workshop. There are bursaries available for teaching staff which effectively make it free CPD.